I really did get some sewing done. Just haven't had a chance to take any pictures and haven't been any where near a computer to update my blog. We had a big afternoon on Friday - firstly, we had sibling contact for two of the children we look after - they are from a family of 9, so we try and get them to see each other at least once a fortnight. Then it was a drive for about 1 hour or so to drop my daughter off to a leadership camp for Cub Scouts. I'd never taken her to a camp and left her with no one she knew. She was the only one from her group who went. Even the leaders were strangers. She coped with this really well. I didn't. Just heart breaking to leave her with complete strangers. Anyway, we finally got home about 8.30pm. DH was at the local Rugby Union club doing duty as the BBQ person for the training night. We have to have a turn each season - two of our sons play rugby. It just coincided with the other things!! So, finally started to sew at about 9.00pm. I was determined to join in the Sew-in. But at that stage of the evening, knew I wasn't going to do anything too complicated. So I did some more work on hexagons. 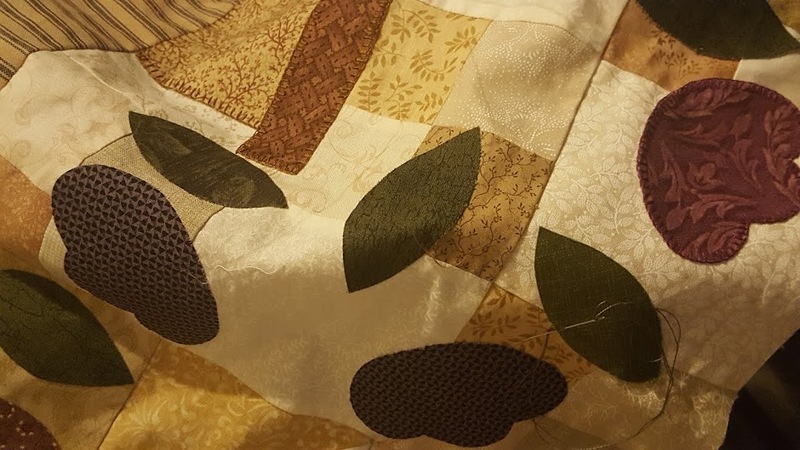 I am working on two quilts with one inch hexagons. The Vignette Quilt and another that I've been working on for about two years. I need to complete the borders on the second one. I'm procrastinating on how to do it - but think now that I will put another border on and applique the hexagons to the border. I'll organise some photos - hopefully tonight! !